As we knew before that ghost mannequin technique was the most convenient way of showcasing a product online. 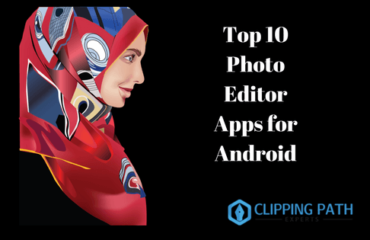 But, Recently Photoshop has upgraded its features and given us some more exceptional way of showcasing e-commerce products on e-commerce websites. One of the most flexible ways of doing it is using the 360° product photo editing technique. It helps us to rotate the product photo properly and showcase it on various e-commerce websites accurately. 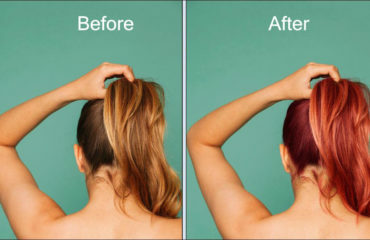 The main strategy a professional photo editing company uses in order to create a 360° product photo is they simply Change Photo Background to White Using Photoshop first. After this, they use Photoshop animations to create a 360° product image. In this article, we’ll show you the complete steps for editing 360 photos in Photoshop. So without further waiting let’s start! 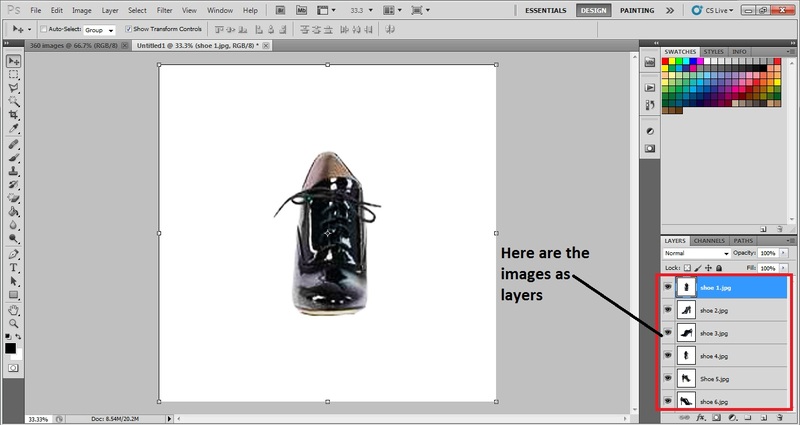 The next part is to open all the images of the product as layers on the layer tab. Here, the product we’ve used is a shoe. We have 6 images of the shoe each and every image from a different rotational angle. 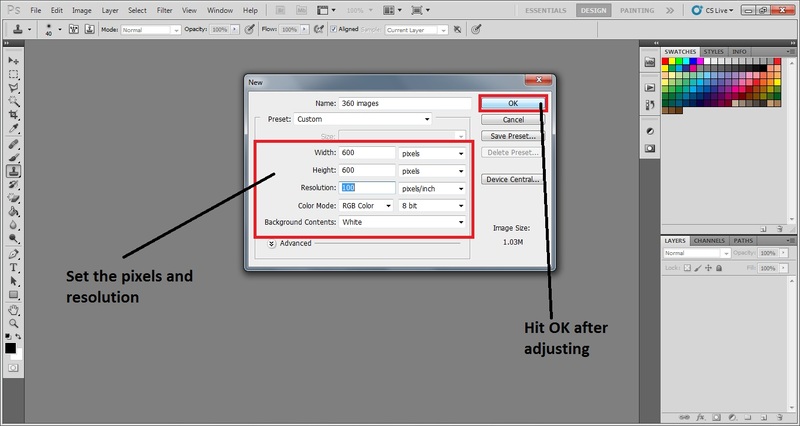 In cs3 it is difficult to open an image by drag and drop. 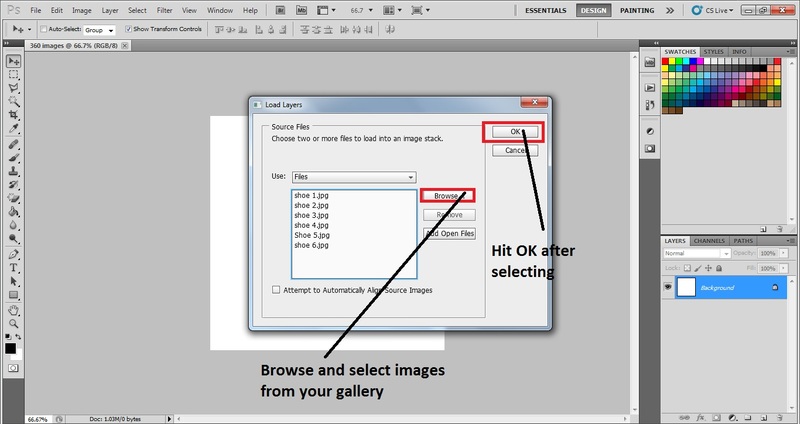 To open an image here we’ll use the scripts option from the file menu. To load the images as layers, go to File > Scripts > Load files into stack. Then you will get a dialog box for browsing and opening the images. Browse the images and hit Ok after choosing them. Then all of them will get loaded in the layer tab. 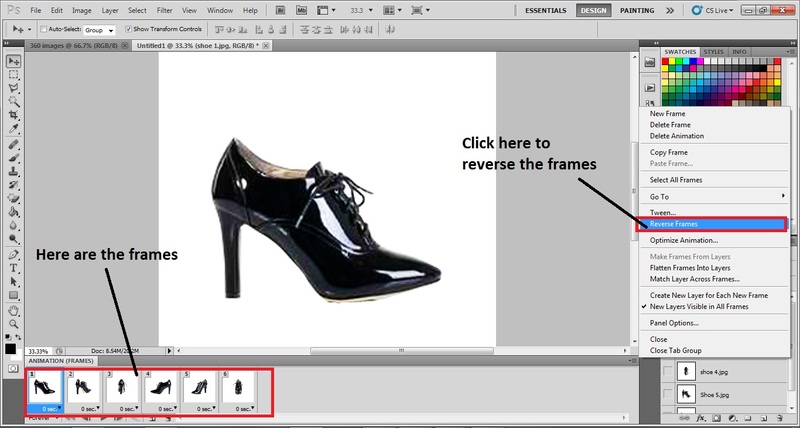 Before starting to create a 360° product image you will need a new layer or canvas for it. 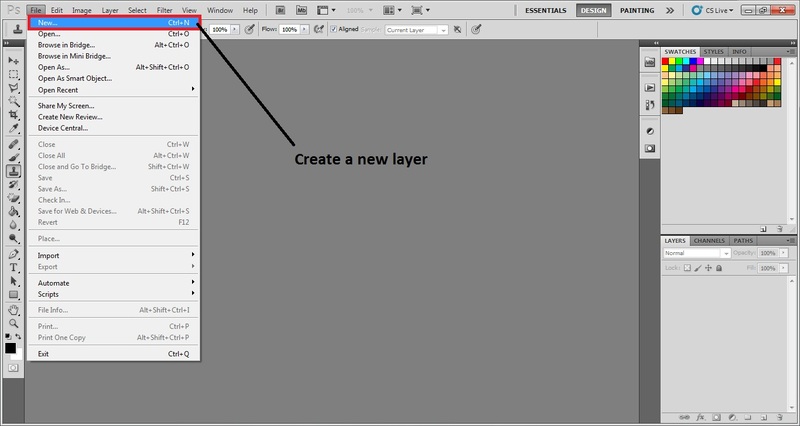 To create new layers on Photoshop go to File> New then you will get a dialog box. In the dialog box, you will have to input the pixels and resolution of the canvas. After putting it you will get a new layer where we’ll start creating our 360° product image GIF. 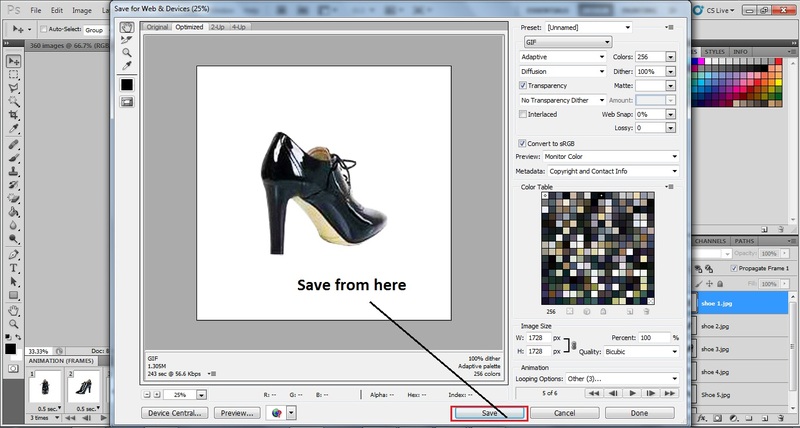 For creating a 360 degree GIF image we will have to use the animation option of Photoshop. The animation option has frames where we’ll have to arrange the images in their rotational order here we are rotating the image from left to right. To activate the animation option go to Window > Animation. Then you will see a new tab called the animation frames. This is where we’ll arrange the photos of the shoes according to the direction of rotation. We will now have to export all our layers from to layer tabs into the frame tab. This will help us to create animation with it. 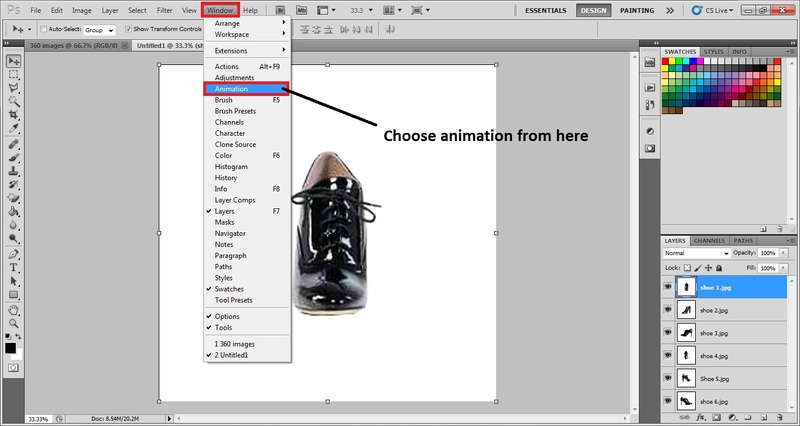 To do it click on the options button on the top right left part of the animation (frame) tab. 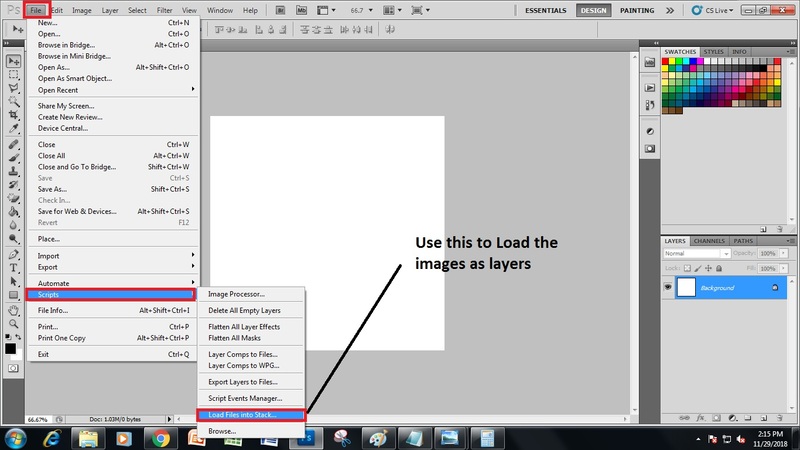 Then click on the make frame from layers option of the options. Then you will see that all of the layers will get loaded as frames. So, now we can start creating our animations. Now you can see all the photos of every angle is here imported in the bottom. But we need it to set in a serial since we want the photo or object to rotate in a 360-degree angle. We will now reverse the frame of the photo in Photoshop. 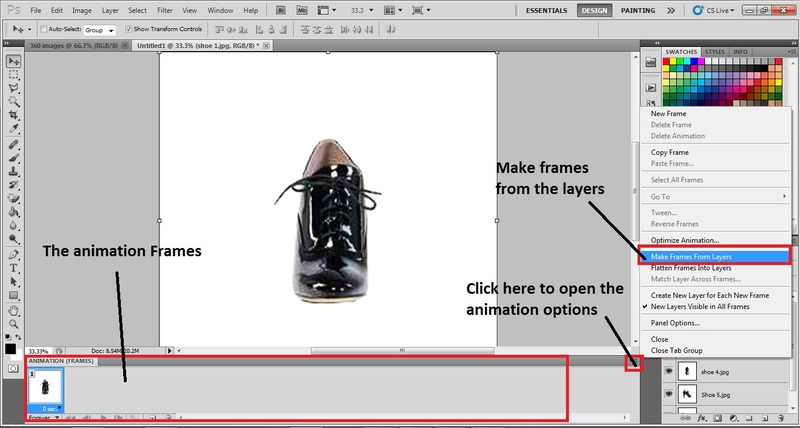 To reverse the frames, click on the options button again on the top right left of the animation. You will get a dialogue box consisting of many options. Click on Reverse Frames from the dialogue box. Doing that, you will see that the photos will come in sequence wise. It is important to organize the frames in the right order to rotate the photo in a 360-degree angle. We can see that all the frames are in the right order now. To see the photo rotating, we need animation. For the animation, we need to set the timer. In this part, we have to decide how long one frame will remain on the screen while rotating. 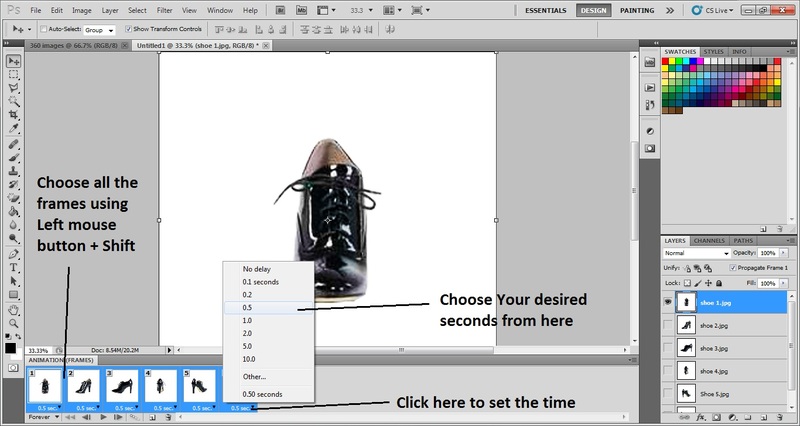 To set the time, choose all the frames clicking on left mouse button+shift. All the frames will be selected doing that. On the bottom of the photo frames, you will see the time is written. Click on that and you will get a dialogue box consisting of a few timers. We have selected 0.5 seconds as the frame timing. How many times do you want to see the frames to be rotating? 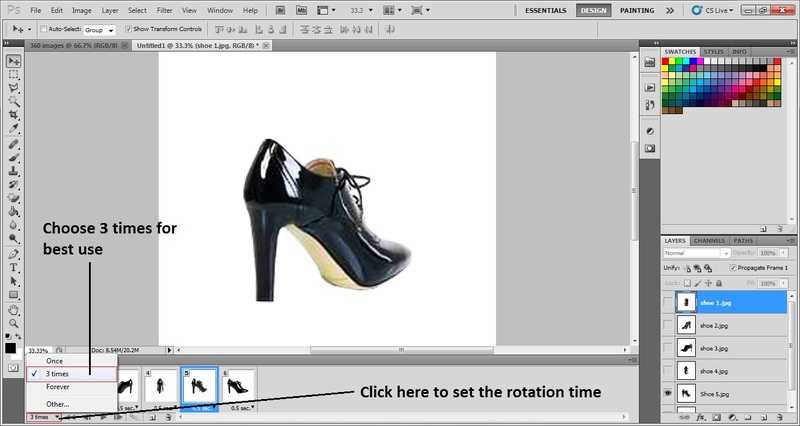 Yes, we can show and see one rotation multiple times if we set the rotation times of the frames in a 360-degree angle. To set the rotation timer, see on the bottom down to the photos there is written times. Click on that and set your required timer. Here we have selected 3 times as the rotation timer. As we have already done with rotating the timer which was the last step of making 360-degree angle photograph, we have to have it for web devices. Saving the animation for web devices is really easy. Click on File>Save for web and devices or press Alt+Shift+Ctrl+S. Doing both the thing, you will be able to save the animation or 360-degree photo for web devices. The animation or 306 degrees angled photo is needed to save in GIF format to save it properly. When you will select save for web and devices from the file, you will get a dialogue box where you will get the options of saving in your required format. Select GIF format from there and press ‘enter’ or click on ‘okay’. The 360 degree angles photo or animation will successfully be saved. Photoshop has truly been a boon for the designers’ around the world. 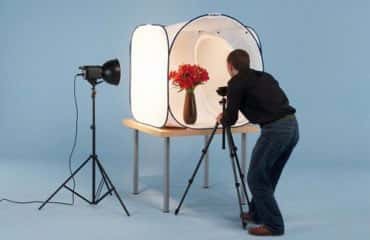 It not just has given them an opportunity to earn but it has also helped the e-commerce websites and e-commerce photographers to also earn a huge profit from their work. This 360 photo editing technique has genuinely helped many companies like Amazon, Ali express, eBay, etc. to generate healthy revenue. It has attracted and helped many customers to judge and decide about the product very easily. Therefore, Photoshop is, by all means, is a boon to the whole e-commerce related industry.